Welcome to Week 31 of Paint Party Friday (Year 2) and to the next edition of our Featured Artist Series! (Would you like to be a PPF Featured Artist? Please click here for details!) 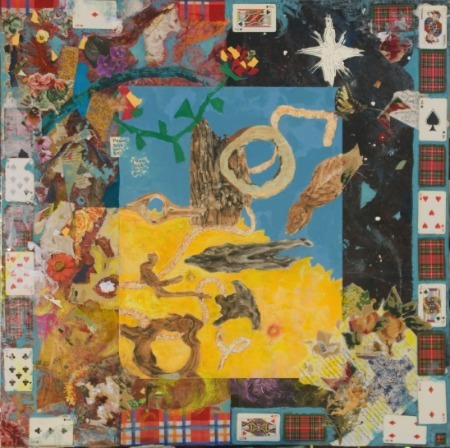 This week's featured artist has just successfully completed an astounding project using a very creative (and slightly unusual) medium. Please welcome Alicia Araya! Please tell us a bit about your personal history with painting. (When did you start painting? How has your painting evolved since you first started?) My father was an oil painter, though for some reason he has not painted in years. He's living on another continent, and painting was a passion, a hobby, something he did not pursue - he was a Navy man, then a lawyer, as well as an artist, as well a self taught electrician, carpenter, etc. Thus I learned how to oil paint at the age most children are still using crayons. Sure, I used crayons as well, and to this day, but you know what I mean... in any event, I followed my dad's spiritual legacy, I suppose, because I was never willing to, in any serious way, commit to one thing. I spent most of my 20s travelling around, partying, enrolling in University, then quitting and getting a job, then finding it dreadful to work and joining University again, then traveling, then being broke ... ad nauseum. Even though art has always been with me, I never seriously contemplated being an artist until after finally committing to receive a college diploma. Vowing to AT LEAST achieve receiving a BA before my 30th birthday, I realized my last 9 months of university that, were I to declare a Bachelor's in Studio Art, I would succeed in graduating (oh my!!!) - I had, in the past 8 years or so, taken enough arts electives to qualify me for that diploma quickly. For anyone who finds this level of cluelessness incomprehensible and possibly even unforgivable, I would like to remind folks that it was quite en vogue in the 90s to instruct our youngsters "go for broke! take student loans! just enroll as an UNDECIDED MAJOR!!! This is THE TIME OF YOUR LIFE!!!" and well - some of us never quite transcended that early well-meaning suggestion. That diploma effort seemed to, at least in my mind, justify focusing time & attention on creating art. Part of my problem has always been that I can never, on a given day, decide what to focus on. The great thing, then, about seriously pursuing the BA was the way it gave me permission to PAINT, or sculpt, or draw, all the time! And I definitely realized that, all other things working out, I could definitely pursue this vector of activity for the rest of my life, if anyone would pay for it, certainly, but even barring that, if I could just be allowed to paint and live somewhere and not starve. So now I find myself at mid 30s able to say "I am an artist and at times a graphic designer", not necessarily because I make a brilliant living at it at this time, but because it is the one thing that has consistently rewarded me, and which I can commit to fully. 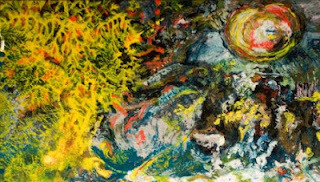 As far as painting evolution, etc: I feel like I am heading more & more towards realism, in some form or other. I started out in an inchoate, sort of untrained way. I then got tired of what I was capable of producing (or NOT capable, as the case may be) which was when I started taking art classes. A drawing class in 2008 radically transformed my relationship to art and rendering, and I am forever grateful for all learned there. As well, it gave me the habit of charcoal sketching everything I could possibly see, which has helped me immensely in painting. What are your favorite techniques, media, and tools to use in creating your paintings? What I have always adored for reasons I can't entirely understand or articulate are the look and plain old capacity to render things in a realistic way. Though I work in many mediums, etc, I want to briefly describe oil painting. I begun with straight up alla prima painting - wet on wet, I believe they call it - and then came to LOVE glazing techniques, thanks to that last oil painting class I took at college, where I learned both the technique & the mediums/chemicals used. Now I am developing hybrid styles mixing glazing with wet on wet, as well as, in an ad hoc sort of way, developing ways to achieve different sfumato effects & specific hues & whatnot through sheer persistence as opposed to actually doing the reasonable way and reading up about various techniques, etc. Experimenting - that's it, in a word. What is your proudest painting moment and/or greatest painting achievement so far? 2012 has been an excellent artistic year for me! I begun by selling my first commission for $500 and shortly thereafter managed to fund my Kickstarter campaign, 90 Paintings in 90 Days, aka the Epic Painting Project, which has allowed me to complete, give or take a little tweaking, 90 oil paintings. These are reinterpretations of the oeuvre of the incredible landscape Romantic era British artist, JMW Turner. These are done on prepped wood panels - not traditional wooden panels, but pieces of driftwood rescued from local waterways. The shapes of the canvases very directly correlate to the subject matter and the composition itself - an effort with which my husband (photographer and artist in his own right) assists me with. He can view each piece of wood chosen, we consult the JMW Turner book of images we have, etc. One painting a day. Intense. This Epic Painting Project has been a highlight, both in a creative and business sense. Being able to Kickstart (as it were) a project of this length and effort is an achievement I, even 6 months ago, could not have fathomed bringing to fruition. It involved more promoting, advertising and selling than I've ever really done in my life, and gave me a look into what arts fundraising is like. Some confidence in terms of future projects will come from that, no doubt. Artistically, of course, the effort is legion. I address many of these matters in my blog turner.aliciaraya.com but, in a nutshell, doing this has allowed me to stick to an artistic discipline, exploit & explore the medium, learn a style from a master, and provide me with a cohesive portfolio group of works - something I've never really had in the past. Additionally, I have sold another commission for a painting project (a large portrayal of the ocean), and have sold a good quantity of smaller works through the site FiVERR. I blog & have blogged about all these things throughout the year. 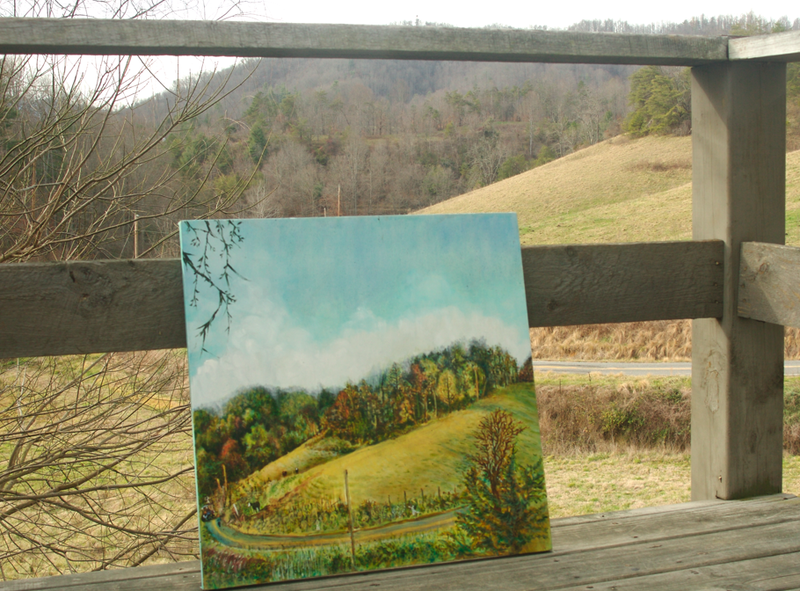 Since then I have managed to receive another large painting commission, and in addition, I have successfully produced (and sold some) close to 100 wood, poetry, and art pieces with Jim, my husband. We call them Homily Sticks and Ponder Panels, and more can be read about these here http://art.aliciaraya.com/2012/08/ppf-and-august-challenge-new-wood-art.html. We are focusing a lot of time producing these in hopes that folks might find then neat as holiday gifts. What's next in your painting future? Let's see... as stated it is a particular difficulty for me, projecting myself to some sort of future, but if I were to extravagantly desire a painting future, it would be one where I could live off painting, doing either commissions and/or successful sales - my overhead is immensely low, so it wouldn't take much in the scheme of things - but consistent income through art is the thing. The other thing I'd dearly love is to go back to school to get an MFA. I would love this like nothing else! I love being steeped in training and study! Also if I have a chance to go back to school I will know better how to take advantage of the benefits of belonging to an institution. Thank you so much Alicia for the wonderfully informative and inspirational interview! I can be found habitually at art.aliciaraya.com, as well as marshallcommunityarts.com - the latter is a blog I keep regarding mine and hubby's artistic activities in WNC where we live. The site for my Turner project is turner.aliciaraya.com, where one can also see the entire portfolio of events, of the project. I have an online shop at Zibbet, http://www.zibbet.com/MarshallCommunityArts where I sell not just my art and our joint wood pieces, but a lot of Jim's photography. As well, I am selling some 'virgin' driftwood pieces so that fellow artists interested in exploring the medium could acquire some of these 'jewels'. I am on facebook here where I also like to post images of work https://www.facebook.com/alicia.c.araya and the facebook page for the work Jim & I do is https://www.facebook.com/marshall.community.arts - I welcome any new FB friends or 'likes'!!! Hope everyone has a wonderful painting filled week! I really admire her Epic Painting Project! Thank you, Kristin and Eva for hosting Paint Party Friday. I look forward to it each week! Wow, what a great interview with Alicia. I hope you get your wish to go back and get your MFA. Your work is awesome. Congrats on all your accomplishments!Way to go! Happy PPF to all. Thanks for hosting, as always! The party is such good motivation for me. 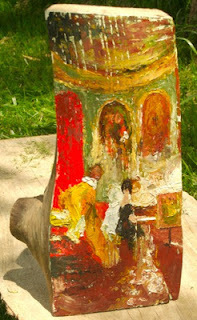 I LOVE your paintings on wood!!!! Thanks for the great interview. Wish I could get my MFA..You can do it!! Love Alicia's art! Always soo inspiring!! Thank you for the interesting interview with Alicia and her wonderful art and thank you for hosting Kristin and Eva! sorry about entering twice - #25 #26! I pressed the "enter" button by mistake before i pasted the right url. It has retained the latest one i entered using the system, that was with woyww. SORRY! The featured artist's work is fabulous! 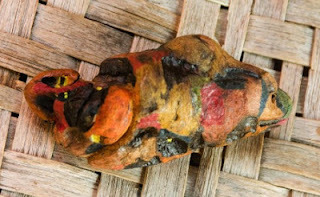 painting on drift wood... hmmm interesting... i will now visit alicia's site and onto the rest of the PPFers. 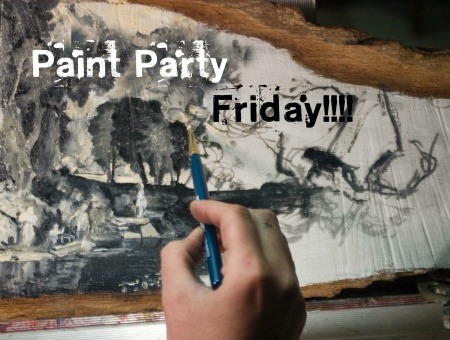 Happy Paint Party Friday everyone. Love the interview with Alicia - that wood art is fantastic too. Loved the interview with Alicia. Drift wood art looks fantastic. I admire the learning process and the enthusiasm she has shown to pursue MFA. Wishing her all the best to let all her dreams come true! Thank you for hosting PPF and I linked twice by mistake. The second link was the one I wanted for this Friday! Beautiful art by Alicia. Love the imagination and the vibrancy of colour. Great interview too. Fabulous interview Alicia..wonderful and inspiring!! Great interview! I love reading about such talented artists. The art is beautiful-I especially love the art on the wood-wow!! I completely enjoyed reading about your life in art! I'm always excited to learn that some people like yourself are actually successful in selling their art on a fairly regular basis! Bravo! You can be very proud of all your accomplishments! What a fascinating read. It does make me want to paint on driftwood. I've got a few bits downstairs I keep meaning to have a go with! I am totally captivated by Alicia's paintings on driftwood. Thank you for sharing her wonderful story! Alicia, your wood art is fantastic- what a unique way to show and delight in your art. Happy PPF to Kristin and Eva and to everyone. Believe my link wasn't working (thanks for telling me Faye),fixed it- hope it works now. I'm back and a purrfect time to see Alicia's paintings on driftwood; adore wood mediums….very beautiful work! Sorry for such a lengthy absenceEva and Kristin and everybody on PPF; it's been a very sad summer . Could you make this link party so it doesn't randomly list? I want to be able to visit this page a couple times and check out lots of art but each time I come back the order changes and I lose where I was and who I already visited. The order changes? I haven't ever seen that happen except when people comment (see comments above) that they have double posted accidently and so we delete the wrong links. There were three of those this weekend. All that did was move others up the list but did not change the order. BTW if you use Chrome as a browser then those you visit become a different colour than those you haven't and it is easy to tell. IE seems inconsistent that way but is supposed to do the same thing. Hope this helps! 90 paintings in 90 days! That is incredible, your work is beautiful. I especially love the landscape from the deck and th idea of painting on driftwood! I love reading these interviews.... it so interesting to hear peoples stories and of course the art is always amazing. I love Alicia's driftwood paintings. I love studying and learning too, and your art is beautiful! I love the passion in Alicia's work. Blessings! Great interview and some very interesting work by Alicia.